I’ve been cooking a lot in my dutch ovens lately. I did my world-famous pumpkin pie, and some breads and chicken things. I haven’t been writing about it, however. That’s mostly because I’ve been doing repeats of recipes that I’d already written up and posted. And, since I hadn’t really made any significant changes or updates to the ingredients or the process, I didn’t feel any real urgency to write them up. Also, I’ve been in a lot of personal stress of late, but that’s not something to deal with here. So, between those two issues, I haven’t really posted here as much as I’d like, but this week, I got really excited and thought to do something new. I started flipping through recipe books earlier in the week, like I used to do, looking for something new and challenging. I wanted to try something I’ve never done before. One thought was Greek Dolmades. I’d really like to try those, but I’d need to find a source for the grape leaves. I know they’re out there in SLC and Provo, but I just haven’t had the chance to look for them yet. I ended up coming across a recipe from the Complete America’s Test Kitchen TV Show Cookbook. I found a recipe for Chicken and Dumplings. Not only have I never cooked it, but I’m not sure that I’ve ever eaten it before. I know that’s weird. It’s about as American as American cuisine gets. But I just don’t remember it. So, I was kinda up against something that I was really unfamiliar with. There are a lot of steps to this process, so it’s not a simple or basic dutching dish, but it is a complete one-pot meal: veggies, meat, dairy, and bread all in one. All you need is a cup of iced Diet Dr Pepper, and your table is complete! 5-6 tablespoons reserved chicken fat. It all started by firing up some coals and heating up some oil in my 12” Dutch oven. While that was starting and heating, I opened up the thawed thighs and seasoned them pretty liberally with Kosher salt and coarse ground black pepper. You could use breasts, but much of the flavor of this dish comes from the chicken fat that gets rendered out of the thighs. The first actual cooking step is to put the thighs on the heat and fry them up. I put the lid on, because they cooked better with the trapped heat. I turned them once during the process. While they were cooking, I sliced and chopped up all of the ingredients in the second set. I removed the cooked thighs, and put them in a bowl to cool. The recipe book said to remove the skin. I decided not to, but in the end, decided that was a bad choice. Having the skin in the soup wasn’t as appetizing as I thought it would be. I drained off and reserved most of the fat that had been rendered out of the thighs. I added the veggies to what remained in the dutch oven, and cooked them, stirring. Next time I make this, I would hold off adding the flour, however, and let the veggies brown a bit. Then, I’d add the lemon juice and scrape up any fond from the bottom of the dutch oven with a wooden spatula. Then, add in the flour, and stir it up to coat the veggies in a sort of a semi-roux. Also, while the veggies were cooking, I cut the chicken from the bones and shredded the meat. Finally, I added the next set of ingredients, the liquids and the chicken, and brought it up to a simmer. While that was heating up, I mixed up the ingredients of the last set, for the dumpling dough. As it approached a boil, I added the herbs, and also added any more salt and pepper to season it all to taste. Then, I stirred it all up and got the dumpling dough. I dropped it in, a heaping tablespoon at a time, all around the Dutch oven. I put on the lid, and then put on the upper coals. The lower coals is really just an estimate. Throughout the cooking process, I was adding more coals to the chimney so I’d have a running supply of hot coals. Once the dumplings were in, I cooked the whole thing for about another half hour or so. I only checked it once during the cooking, then again when it was all done. I was afraid that the dumplings would be soggy. Like I said before, I wasn’t sure what to expect. But, in the end, it was delicious. 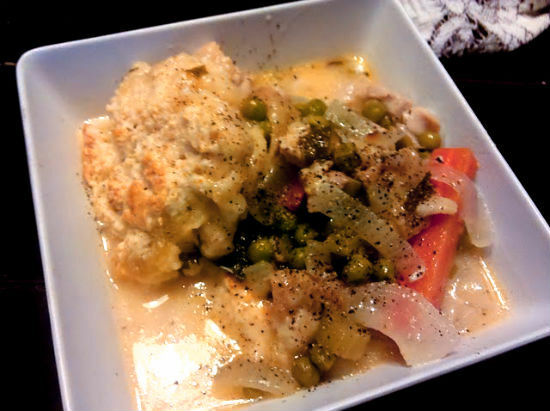 The dumplings swelled up as they cooked, like biscuits do, and the stew was delicious. The dumplings were rich with chicken flavor, from both the stew and the chicken fat added in. There was plenty to share and extra for lunches this week. Mark has discovered a love of Dutch Oven Cooking. Mark also has other sites and blogs, including MarkHansenMusic.com and his MoBoy blog. My Latest Dutch Oven Cookbook Available at Amazon.com! Get your copy and start baking great Dutch oven bread! Don't Have a Dutch Oven Yet? Don't Wait! Join the Fun! Member of The Outdoor Cooking Guild! More Great Dutch Oven Recipes from a Legendary Cast Iron Chef! Click to Buy! Linking - I'd love to exchange links with anyone who has a dutch oven-related blog or website. Simply email me, or comment on a posting. Using the Recipes and Articles - If you want to include one of my recipes or articles on your dutch oven or other site, I'd definitely encourage that. I do make some requests, though. First, please link back to here at Mark's Black Pot (just copy and paste the URL from your address bar). Second, if one of my recipes credits someone else, mention that in your recipe page, too. Third, if you do share my dutch oven recipes or articles, I'd love to hear about it. Again, simply email me.